February 2nd was Groundhog Day, and I guess Resetti is the closest thing to a groundhog in town, so he was the sort of mascot for the occasion! 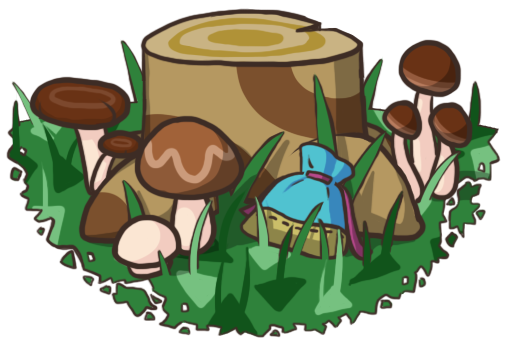 It would’ve been cool if he actually came out to the plaza for a shadow-viewing ceremony or something; I don’t get to see him much these days, since I haven’t built the Resetti center PWP. Waving to Melba 🙂 I remember in Wild World you could wave to villagers by tapping them with the stylus, and I realized in New Leaf you can still sort of wave to them using the emotion (a bit less convenient though). Geez, asking a bit much aren’t you? And Rod asked me to catch a coelacanth once when it wasn’t even raining! And she gave me her picture in return! ^_^ I think this is the fourth one, I might’ve lost count. Melba hosted the party at her house, and if I remember correctly, I think Melba might be the only villager Violet has ever talked to at all. 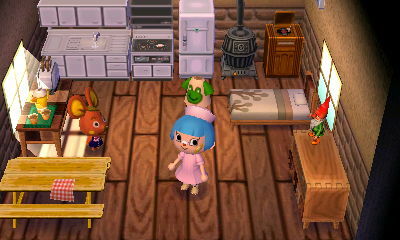 >_> I prefer to not talk to villagers with my other characters. Violet’s birthday gift was a random wallpaper — ouch! Far from what I was hoping for, a birthday cake. I should’ve guessed, but I suppose you have to be at a certain friendship level with the neighbors hosting the party in order to receive an item from the birthday set. 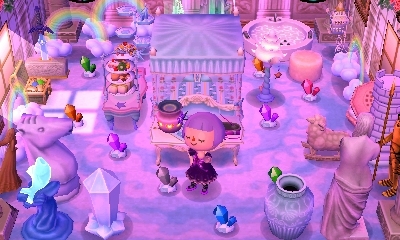 I thought Violet’s house entrance looked pretty with spring’s changes! …is a Major downgrade. 😦 Ahh it looked so lovely before with the snow on top of the bushes and the white flowers to match, and now it doesn’t look as good against the bright green imo. But it should look better once the greenery gets darker later on, and after the holly berries go away! I actually didn’t choose holly bushes for Estel’s hedge because of the berries; I chose them because they’d be nice dark, netural bushes for most of the year. How the early spring version of my fairytale bridge path looks. I have more work to do to get my town looking nicer for spring, though: re-planting the cedars with oak/fruit trees, flower re-arranging, etc. I recently made some lists on the AC:NL item catalog site MoriDB. One is a wish-list of items that I’d love to have. In return, I can offer anything in this catalog list, which currently includes all the furniture, carpet, and wallpaper I own (maybe later I can add apparel). But that’s an extremely long catalog list, so I also have a shortened list of rarities I can offer (non-orderables, DLC, etc.) that you can browse instead. I’ll add these lists to the sidebar later so they’re always available! In addition to furniture and such, I can also always offer bells and/or hybrids! Just to be completely honest and clear here, the reason I can offer some of those rarities is because, well — this is a controversial subject — I have access to two 3DSes and multiple copies of the game, so I have the ability to dupe. I like that I can do this now because it means that I don’t have to be so restricting about giving others non-orderable items, but if you have a problem with receiving duped items, feel free to let me know and I won’t ever give you any (not that they’re any different from real items, but I’ll respect your wish!). Posted on April 24, 2014 by Amy •	This entry was posted in AC:NL, Citalune and tagged Animal Crossing. Bookmark the permalink. Awesome, thanks!! 😀 What I can give in return partly depends on what you would like — is there anything you’d like on my rarities-I-have-to-offer list, or from my catalog? If so, I’d be happy to give that in return, and if nothing there interests you, I can always just give you bells/hybrids, or dupe you a crown (which you can either use as an accessory or sell it for lots of money). I actually already have a crown and a royal crown from a Japanese girl at Club Tortimer! 😛 I thought the afternoon tea set looked nice, but it’s probably asking too much… I’ve seen it go for millions before, after all. Hehe yeah, I can see what you mean about that! I think Estel’s castle area especially shines in the wintertime, and Lyra’s castle area would look amazing with the mid-October gold trees (shame that I didn’t have the gold roof yet for Lyra when I had the gold trees in my town). And Violet’s house looks great in the springtime ^^ But the pattern ends there, I think, because Fern’s house will just be a sort of rustic-looking cottage, so it won’t look especially amazing in the summertime compare to other times of year. Are you online right now? 😛 I’ll open my town if you’re not busy doing anything else! I am! 🙂 Sure, I’ll look for your gates, thanks! Aww! I like Isabelle’s suit in groundhog day! haha. xD and your town looks quite lovely in spring! Thanks, I’m glad you think so ^_^ I was worried my town wouldn’t look good in springtime. 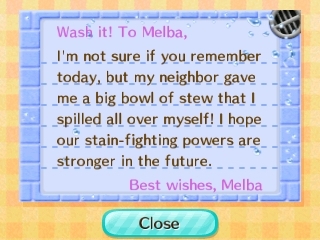 Awww Melba is such a cute villager, this post had lots of pictures of her, and I really got to admire her cuteness ^^ And you got her picture, great!! And your town looks lovely for spring, all the entrances to your houses look amazing to me!! Oh and I also wish we could trade something, but I’ll have to see if I’m able to access any item on your wishlist when I get the game! I agree, she’s so cute and sweet as always! 🙂 I’ve accumulated quite the Melba picture collection. Aww, thanks Jemma, I’m glad you think so! ^_^ And don’t worry about that, hehe, I wouldn’t expect someone who’d just gotten the game to give me stuff on my wishlist xP I’d want to help you out with stuff! Oh!! Very interesting, that’s really cool, I guess being the mayor in your town will just be a very different experience in general, so I should expect numerous surprises heheh. Aww.. Cute pics. I like the way the flowers are arranged. Anyway I have an unwanted coffee cup, could I have it for the afternoon tea set? Thanks! I love arranging flowers 🙂 And sure, that sounds great! And if you want, after I receive the coffee cup I could dupe it and then give one back to you ^_^ I also have a hibiscus clock I can give you sometime (still need the hydrangea bed though). Well.. I’m really sorry but I accidently sold it, and it’s not reorderable. Wow, thanks so much!! I just successfully duped a set of flower furniture for you (though I’m missing the hydrangea bed), along with the autumn wall & flooring, and the dollhouse dress. I also ordered for you the horoscope furniture I have so far, and a few other things that I remember you mentioning you liked in my rooms (the mermaid statue and the dessert case). I can also work on duping/ordering other items in your wishlist that I have! Okay, I’m done ordering and duping stuff for you! 🙂 Think we could WiFi sometime this weekend for the trade? I’ll open my gates at 7 PM my time, but feel free to just drop by whenever you can — no rush! Ah and I wouldn’t want to interfere with your schoolwork, so it’s fine if you can’t make it 🙂 We can always do it another time. Hope your quiz has/will go well! 🙂 My gates are open, but again, it’s okay if you’re too busy and can’t make it! Haha it’s funny that they went to the effort to put Groundhog Day into the game and make Mr Resetti the mascot. Pity he doesn’t actively participate though. I didn’t use the wave feature enough in Wild World to make it a habit I tried to do in New Leaf, but looking back, I do think it was really cute and handy to easily wave to neighbors like that! 🙂 Now that I think about it, I think they took the sound effect of waving to neighbors in Wild World, and made it part of the waving emotion in New Leaf (could be wrong though). I agree, I loove Erik’s cozy cabin-style interior! 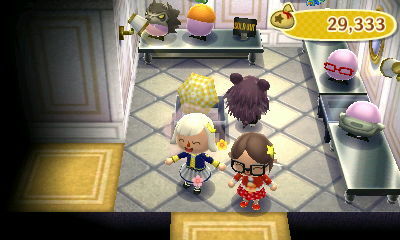 And I agree many of the villagers are quite good decorators in this game; one of my other favorites is Diana’s. For restoring their rooms, I often make use of the times when they invite me to their house to buy something that’s messing up their interior. Then later on I can give them a piece of furniture (through the mail, or through an errand) to fill up the empty “hole” in their house where the offending item used to be. Sometimes they even flat-out ask you for help in replacing a piece of furniture, too, though sometimes I don’t want to help with such an errand if the piece of furniture they’re asking to replace already looks great in their house! 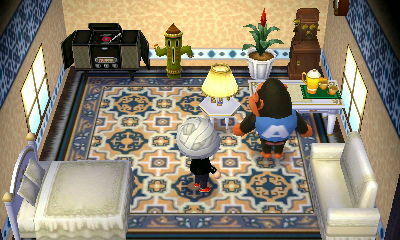 There’s also this villager house re-decorating guide, but I haven’t tried that method myself yet. Judging from that guide, it looks like the next darker-grass change should be in late April! And then it gets even darker in July. Wow, congratulations on getting such a cool item from the birthday set, and I hope you had a great birthday! 😀 And wow, that’s reallyy nice of you to offer to lend it to me, thanks a lot! If you do, I promise I’ll dupe it right away and give it right back 🙂 And I hope your 3DS is repaired all safe and sound!